Forever Manchester is delighted to be the chosen charity for 2016’s instalments of the Sportsman’s Curry Clubs, held at Spinningfields favourite ‘Scene’. The curry club, which was formerly known as The Dewi Morris Curry Club was first conceived in September 1996, which began after the former Rugby Union player retired. The Sportsman’s Curry Club will be supporting Forever Manchester over five events throughout 2016 and Chief Exec, Nick Massey will be speaking to attendees at the next club, to be held on 20th May. Speaking at next week’s event will be Pat Murphy, who has been reporting on football and cricket for BBC National Radio Sport for the past 30 years. There will also be entertainment from comedian Lea Roberts. Lea has a sporting background in professional Rugby League, and his comedy is based on traditional Northern humour with a “more modern approach”. Scene, where the five events will be held is an Indian street kitchen which has had rave reviews since it opened in April last year. Tickets for the event are £60 per person. 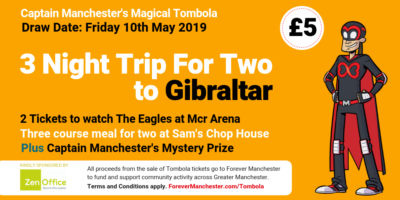 If you’d like to purchase tickets and support Forever Manchester in the process, please head to the Curry Club website by clicking here.